It finally arrived this weekend. It's a Rally with most of the options. I did not get the side bags because it covers the cool back wheel too much. I also did not get the passenger backrest. I am looking to put a top case with a backrest on it. Sorry about the poor quality of the photo. It's just off my crappy Motorola Dumb phone. I also have all my father's worldly possessions in my garage so it's pretty cramped and cluttered in there. Previously : 2008 GS-SM5 (silver), 2009 RS-SE5 (red), 2010 RT-S Premier Editon #474 (black) Pictures of 2008 and 2009 Spyders are in Alaska Albums 2009 and 2010. They still haven't landed in Aus. 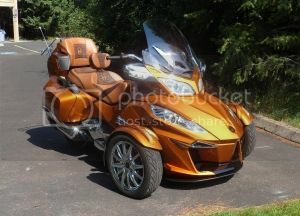 Congrats on the Ryker, I think it goes VERY well with the Caddie behind it! Sounds like you fitted yours out (or planned fittings) like I would too. Wife says I gotta win a lottery or something before I can buy another 3 wheeler. Congrats RH very excited, can’t wait for your feedback. Thanks guys, I'm glad to be back in the club. Since the Ryker is 300 lbs. lighter I assume the riding dynamics are vastly different. I wanted something more agile and quick. I hope it is. Thanks, yes I am still in love with my black CTS. It's a 2012 and payed off. It does not have the fancy color touch screen like the new cars, but other than that it still looks contemporary.